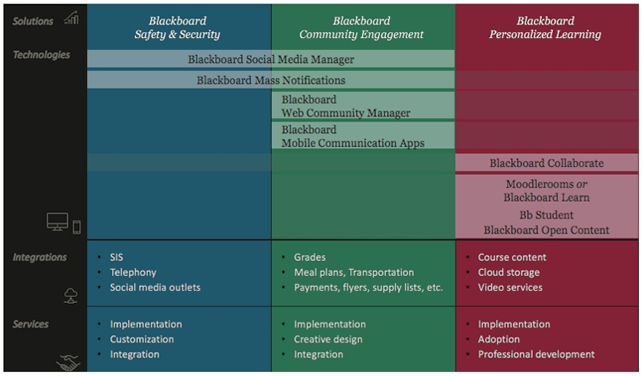 Blackboard is offering up new bundling and product names specifically for the K-12 market. The announcement comes on the cusp of the education technology company's Europe-based Teaching & Learning Conference, taking place this week at the University of Groningen in the Netherlands. The Blackboard K-12 New Learning Experience (NLE) platform consists of a mix-and-match compilation of products, professional services and integration for districts and schools. The solution sets broadly cover safety and security, community engagement and personalized learning. The K-12 New Learning Experience platform bundles various Blackboard products and layers on integration and professional services. Blackboard Open Content, previously named xpLor. Potential integration covers student information systems, lunch menu data, the school calendar, payments processing and transportation services. In a blog article Blackboard's Vice President of K-12 strategy, Stephanie Weeks, suggested that the announcement is really about the completion of integration of Blackboard's own technology with two companies it had acquired in the last 18 months: school communication company Parentlink and Schoolwires, which hosts and manages Web sites for K-12. The new platform, she wrote, offers "many of the products you know and love only more deeply connected to one another through smart workflows, more integrations with your other district technologies through great partnerships and data connections."